There is often a need to convert a file from MP4 to MPEG format. MPEG is short for "Moving Pictures Experts Group", and refers to the family of digital video compression standards and file formats created by the ISO Group. MPEG is reputed to produce better quality videos than its competing formats like QuickTime. Unlike earlier, when PCs required hardware codecs to play MPEG files, the technology of today is totally relying on software codecs along with other products from programs like Real Networks, or Windows Media Player. Even with its lousy compression and diminishing data, MPEG is successful in having the human eye escape its errors. In this article, you'll learn the best way to convert MP4 to MPEG/MPEG-1/MPEG-2, the free MP4 to MPEG converter, also the MP4 to MPEG online solution. As a powerful desktop application, Wondershare UniConverter has succeeded in helping numerous customers with their video conversion needs. Playing with a number of formats have now become easy as Wondershare UniConverter comes with the capability of processing files from different formats and delivering the output as per your requirements. With this best MP4 to MPEG converter, watching, sharing and enjoying videos at any device has been made feasible as you can now opt for different formats while converting their videos. Having emerged as the fastest converter in the market, it seconds its rival by a speed which is 30 times faster than the conventional applications. The compatibility has now been enhanced as you can convert your videos virtually into any format to go with their peripheral and desktop devices. Through Wondershare UniConverter, you can now stream their media onto their televisions without the use of any connecting devices like USB or Wire. With an impeccable DLNA Support built in, it also allows users to store HVEC videos in a small size without losing out on quality. You can now transfer your videos to iOS & Android devices, USB flash drive and external hard drive. 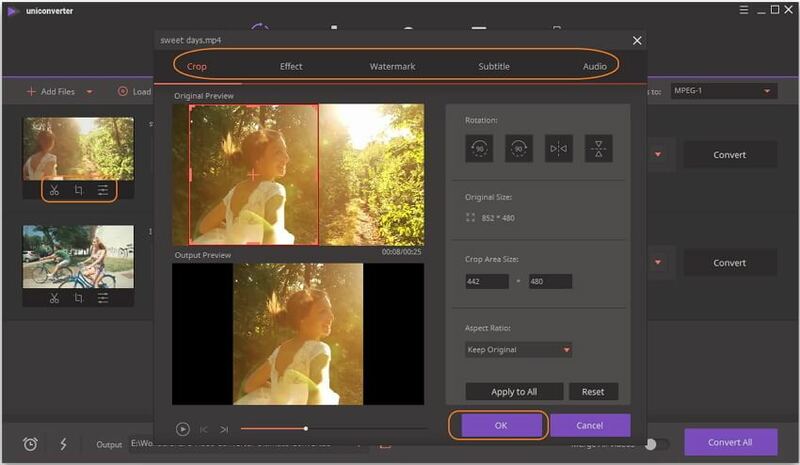 A built-in editing tool allows users to add different elements to their videos. The editing interface is easy and can be accessed by any user to add scintillating video effects. A single click Video Downloader would help you store any video offline when you view it in your browser. Carrying your media files just became easier with this application. Converting MP4 into any of the given MPEG formats requires you to download Wondershare UniConverter from the website or the download link below. After downloading the software, install and open it on your PC/Mac. Then, select the MP4 file you want to convert by clicking on the Add Files button. Simply drag and drop MP4 files can also input. Multiple files can be added for MP4 to MPEG conversion. Optional Edit the MP4 files. Once you have completed the file upload, you can make some changes to your video with a real-time preview. You only need to click one of the editing buttons under the video thumbnail to enter the Editing window. This is an easy-to-use tool and comes with multiple options to enhance your video, like trimming, rotating, adding subtitles, etc. Step 2 Select the target format as MPEG/MPEG-1/MPEG-2. 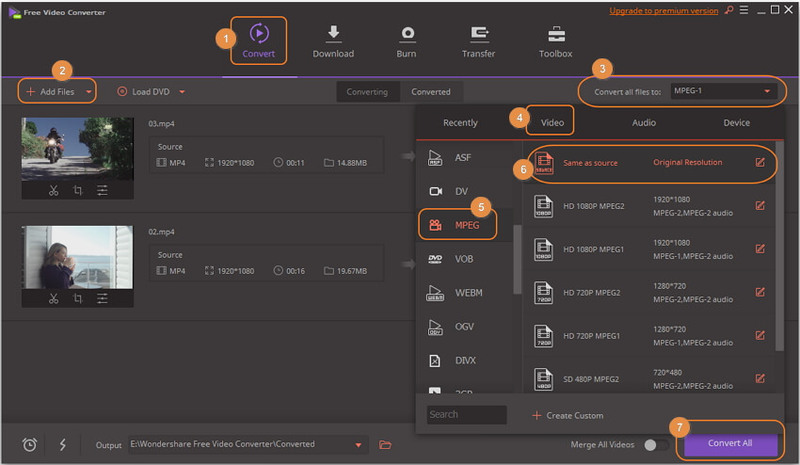 Once the editing process is complete, select the target conversion format from the drop-down icon of Convert all files to, and choose the MPEG format and resolution from the Video tab. Various video formats are provided here. click on Convert All. This should initiate the conversion of the file. The location on the left-hand side specifies the folder where the file would be saved. Finally, click on the Convert All button to start the MP4 to MPEG conversion. The process will be finished in a while and you can find the converted videos from the Converted tab. Wondershare Free Video Converter allows you to convert videos into any format at a good speed. It offers the facility to convert MP4 to MPEG/MPEG-1/MPEG-2 free on Mac/Windows. It supports most common video formats like MOV, MKV, MPEG, AVI, and others for free conversion. As the free version of Wondershare UniConverter, you can follow the similar steps to convert MP4 to MPEG or follow the simple steps listed below. Offers a fast conversion speed that outshines many conventional converters in the market. Single button YouTube video downloading option is integrated into the converter. An editing tool with an effective interface allows users to make modifications. 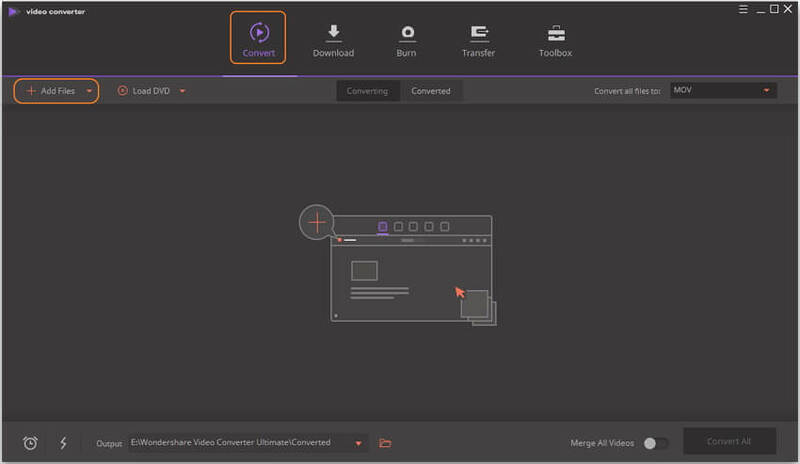 Step 1: Once you are done with the downloading and installation process, run Wondershare Free Video Converter on your computer. You can upload the desired videos by clicking on the Add Files button, it also allows you to simply drag MP4 videos to the program. Step 2: Once you have uploaded the video to the program, choose the output video format from the Convert all files to: option, open the drop-down list and choose Video > MPEG from the given options, video resolution should be selected here. Step 3: You can now click on the Convert All button to convert MP4 to MPEG for free. The process will be finished soon. 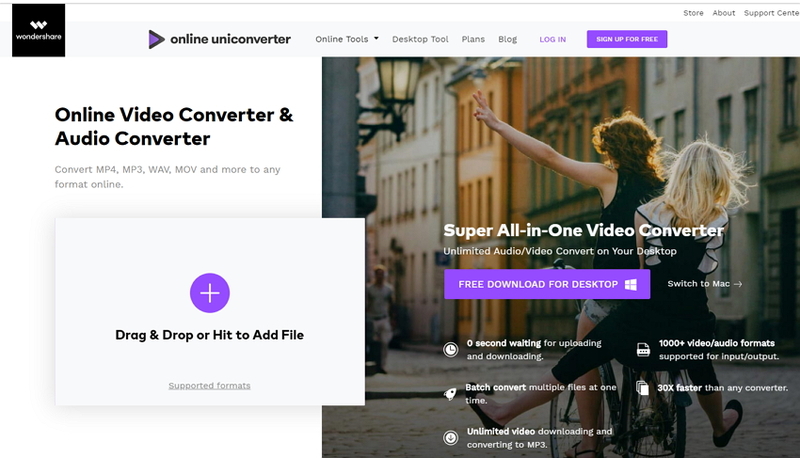 Online UniConverter (originally Media.io) lets you convert MP4 to MPEG/MPEG-1/MPEG-3 online with file size less than 100MB. 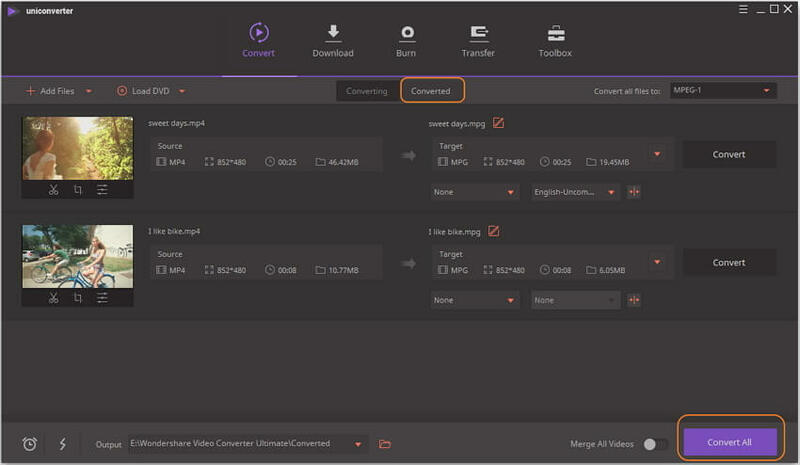 If you don't use conversion function very often, it will be a good option to use Online UniConverter (originally Media.io) to convert MP4 to any format as you wish. But to convert larger size of file, you'd better upgrade to the desktop converter. As for large files, it will take a long time to upload and download files online. Description MPEG (an acronym for Motion Picture Experts Group) is a container format used to store both video and audio that comes in different standards such as MPEG-1, MPEG-2, MPEG-3, MPEG-4 and much more. MP4 is a container format used to store video, audio, and subtitles data. Since stores like iTunes uses this container format and it is used with iPod and PlayStation (PSP). It becomes a popular format.